Quantzig, a leading analytics advisory firm that delivers customized analytics solutions, has announced the completion of their new article on the importance of big data and AI for businesses. Technologies like big data and AI are evolving rapidly. As a result, there has been an increase in competition for businesses to offer more personalized experiences to their customers. But many organizations still struggle when it comes to data integration from multiple sources. Therefore, they look for big data and AI solutions to process and analyze the large datasets to extract meaningful patterns and trends that can aid in better decision-making. Are you finding it difficult to manage the sheer volume of continuous data? Our artificial intelligence based analytics solutions can help. Get in touch with our experts to know more. 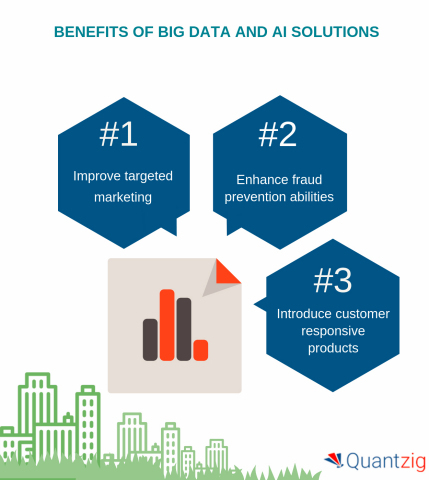 Big data and AI solutions have helped businesses improve targeted marketing immensely. By leveraging big data and AI solutions companies can understand their customer behaviors and preferences and combine the insights obtained from their traditional data sets with social media data, text analytics, and browser logs to predict future demand for products or services. Request a free proposal to know more about our portfolio of data analytics solutions. The capabilities of fraud detection tools powered by big data and artificial intelligence models can safeguard businesses against sophisticated fraud schemes. By leveraging video recognition, natural language processing, speech recognition, machine learning engines, and automation, companies can track the unusual activity easily at all levels of business operations. Request for more information to gain in-depth insights into the benefits of leveraging big data and AI solutions. Apart from improving customer service, big data and artificial intelligence solutions are also enabling companies to develop customer responsive products. Today, product design is aimed at fulfilling customers' needs in ways never possible before. Big data and AI technologies have enhanced business capabilities to analyze the customer's need through data analysis. Wondering how our big data analytics solutions can help you gauge business performance and maximize ROI? Request a free demo now!